Amelie Crowe is an aspiring Breton assassin trying to join the ranks of the Dark Brotherhood. 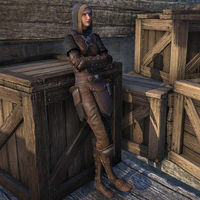 She will appear inside any Outlaws Refuge, or alternatively at the Anvil docks, and share with you some information about how to best get the attention of the Brotherhood. 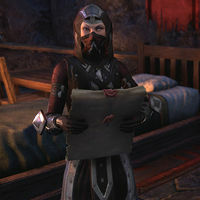 After you've completed Filling the Void, Amelie will appear inside the Dark Brotherhood Sanctuary, wearing the Brotherhood initiate clothes, so it's apparent that she, too has succeeded in her quest to join the guild. You can find Amelie Crowe inside any Outlaws Refuge, where she will comment, "This place is nice, but it's not a home. It feels like I'm hiding down here. People like us, we need powerful friends if we're going to make it in this world." "Word of advice. Urges aside, the Dark Brotherhood prefers to keep a low profile. Just remember—kill an innocent, get noticed. My sources say they're recruiting in Anvil, on the Gold Coast. I'll be at the docks there if you want to talk some more." If you instead meet up with Amelie at the Anvil docks, she'll ask, "Is it time? Has the Dark Brotherhood finally noticed my impeccable work? I'm ready, dark one! I swear, in the name of—wait, I should let you talk first." "No risk, no reward, my aunt Ophelia always said. Look, people like us, we need to surround ourselves with like-minded allies. People that will protect us and help us reach our true potential. They're going to notice me, I just know it!" You want me to just go up and kill a random person in cold blood? "I don't want you to do anything. I'm just providing information. Letting you know that new opportunities are available if you're willing to spill a little blood." You're rather open and nonchalant about this. "Don't take my willingness to help out as a sign or anything. I recognized a kindred spirit and suggested a way to satisfy your darkest urges. They'll get you killed if you don't keep them under control. And if you don't find the right allies." You're wrong. And possibly insane. "No need to be all insulting about it. Just remember that I understand. That mask you wear every day. The one you're desperately afraid is going to slip one day. You could throw that mask away in the Brotherhood. They want you for who you really are." I've killed before. Why hasn't the Dark Brotherhood contacted me already? "Hey, I don't know exactly how they select new recruits. I'm just telling you what I've heard. Maybe you just need to be in the right place at the right time. Like Anvil. Of course, I've also heard they have eyes everywhere, so what do I know? How do you know so much about a secret organization of assassins? "That's one of the best things about the Dark Brotherhood. It hides in plain sight. No one knows where its headquarters is our how many members it has. Yet you can go into any library and read a book about them. It's brilliant, really!" You've read a book about the Dark Brotherhood? "Quite a few, actually. My favorite is "The Night Mother's Truth." It describes the origins of the Brotherhood, although it might all be theory and conjecture. But forget the books! Everyone knows the Brotherhood exists. And most people fear them." What are the benefits of joining a group like that? "Fellowship, safety, and security, to name just a few. I understand there's also a steady flow of gold from all the contracts. And you get to kill people! Can you imagine a better guild to belong to? Better than picking pockets, if you ask me." Why do you think Anvil is the place to get noticed? / So you think Anvil is the right place to get noticed? "I'm not one to reveal my sources, but Fat Grakal told me that he heard Seaworthy Saralla say that there have been some mysterious murders committed on the Gold Coast. To me, nothing says Dark Brotherhood like mysterious murders!" But why do you think the Dark Brotherhood is looking for recruits? "Oh, I got that from Margog the Hammer. Buy him a couple of ales and he spouts secrets like a bard spouts poetry. Just the other day, he told me that his cousin Krusk killed a baker in Anvil. He received a mysterious visit that very night." "You really don't know anything about the Brotherhood, do you? If they decide you're worthy enough to receive an invitation, one of their dark dignitaries shows up to deliver the news in person. It's kind of creepy, but it's also a singular honor." After you have completed the quest, Amelie will appear inside the living quarters of the Sanctuary. When you speak to her, she says, "It's good to see you again, friend!" or "I trust your contracts have been abundant and lucrative?" "You don't remember me, do you? We ran into each other on the streets of Anvil some time back, when it seems both of us were looking to attract the attention of the Dark Brotherhood." "Yes! That's it! I love that, don't you? The silence that fills the void where words should be. It's positively pregnant with menace. The effect it has on people is unmistakable." "I should probably be cursing your name, you know. I'd been trying to grab their attention for days, and then you arrived to haunt the Gold Coast like some malignant wraith. I had to redouble my efforts." How many people did you kill, exactly? "Hmm, let's see. I kept a list. La, da, da, da, da ... looks like thirteen." You murdered thirteen people just to get the attention of the Speaker? "That's how it's done, isn't it? Death is our business, and business is good. I'm quoting the Matron, of course." "There it is again! Makes my blood run absolutely cold. You're magnificent at the silence thing!" That's not how this works. You should be more discreet. "You think so? I suppose you would know, the way I hear it you're the Sanctuary's new darling. I'll consider what you said." Good. This is obedient duty, not murderous playtime. Regardless, she'll finish the conversation by saying, "Sure, sure. Well, I'd best be off. May the Dread Father guide your blade." Amelie Crowe: "I heard there was some trouble at the Sanctuary. What did I miss?" Grazda: "Are you new here?" Amelie Crowe: "I was around since ... you know, nevermind." This page was last modified on 1 October 2018, at 19:13.